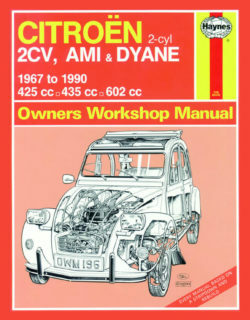 2CV, 2CV4 and 2CV6; Ami 6 and 8, Saloon and Estate; Dyane 4 and 6; inc. special/limited editions. Petrol: 425, 435 and 602cc. 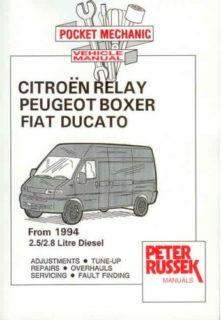 Citroen Berlingo Multispace and Van (inc. ‘First’) and Peugeot Partner Combi and Van (inc. ‘Origin’). Petrol: 1.4 litre (1360cc) and 1.6 litre (1587cc). 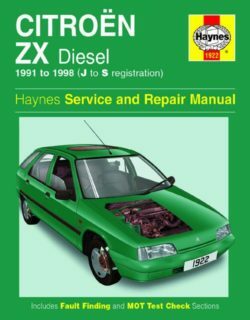 Diesel: 1.6 litre (1560cc), 1.8 litre (1769cc), 1.9 litre (1868cc and 1905cc) and 2.0 litre (1997cc), including turbo. Van, including Champ and special/limited editions. Petrol: 1.0 litre (954cc) and 1.1 litre (1124cc). 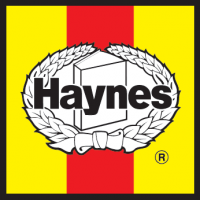 Does NOT cover features specific to Pick-Up and Chassis Cab. 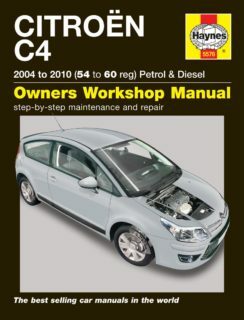 A5, 232 pages, with detailed description of removal, installation, adjustments, repair, overhaul and servicing of all the major vehicle parts, (except body), including engine overhall, carburettor, clutch, brakes, steering, transmission, (except overhaul), front & rear suspension, drive shafts and engine electrics, with exploded views and complete technical data and wiring diagrams. Hatchback, including XTR. Also covers C3 First to 2010. Petrol: 1.1 litre (1124cc), 1.4 litre (1360cc) and 1.6 litre (1587cc). Turbo-Diesel: 1.4 litre (1398cc) and 1.6 litre (1560cc) HDi. Does NOT cover features specific to Pluriel Cabriolet, or models with SensoDrive transmission or 'Stop and Start' system. 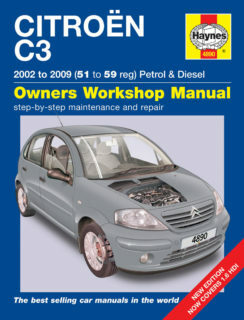 Does NOT cover new C3 range introduced 2010 or C3 Picasso. Petrol: 1.4 litre (1360cc) and 1.6 litre (1587cc) . 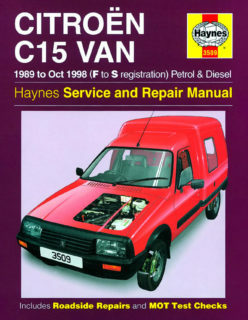 Diesel: 1.6 litre (1560cc) and 2.0 litre (1997cc). 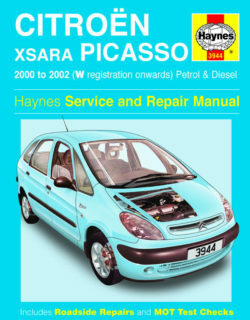 Does not cover features specific to C4 Picasso or Grand Picasso. 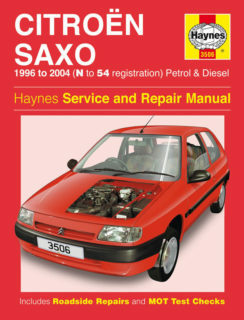 Petrol: 1.8 litre (1749cc) and 2.0 litre (1997cc). 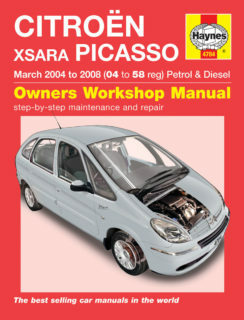 Does NOT cover models with 3.0 litre V6 petrol engine or 2.2 litre diesel engine. Does NOT cover revised range introduced April 2008. 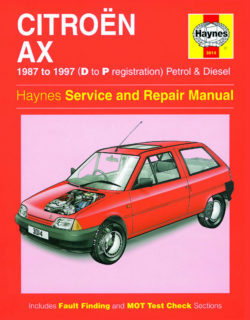 Detailed description of removal, installation, adjustments, repair, overhaul and servicing of all the major vehicle parts (excluding body) including engine, valves, diesel fuel injection system, turbocharger, clutch, brakes, steering, front and rear suspension, transmissions (except overhaul), drive shafts, electrical equipment with wiring diagrams, exploded views and complete technical data. 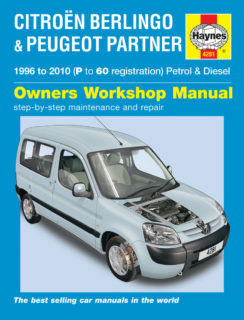 Small though this Workshop Manual is in size, it lacks no detail in covering the whole of the servicing and repair of the range of vans from Citroen, Peugeot and Fiat marketed under the names of Citroen Dispatch (also known as Jumpy), Peugeot Expert and Fiat Scudo since introduction to model year 2001 with a variety of diesel engines. Three different diesel engines are covered; the 1.9 litre engine with and without turbo charger and indirect injection and the 2.0 litre HDi direct injection diesel engine with 8 and 16 valves. Also covered in the manual is the 2.1 litre diesel engine with 12 valves which is, however, not fitted to the van versions. 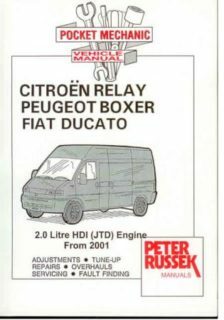 The information is based on the Citroen version. 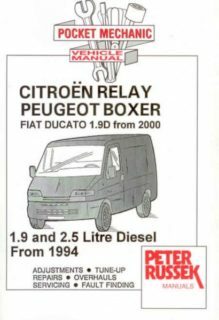 Small though this Workshop Manual is in size, it lacks no detail in covering the whole of the servicing and repair of the latest Citroen Relay and Peugeot Boxer vehicles with diesel and turbo diesel engines from 1994. 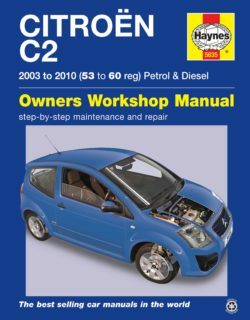 This manual is intended for vehicles built to UK and Europeanspecifications with a gasoline/petrol engine unless diesel is specifically mentioned. Whilst many details are useful for the same make and model of car built for other markets, such vehicles may have different features, especially in areas concerned with safety and emission control. 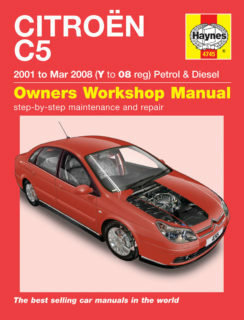 Detailed description of removal, installation, adjustments, repair, overhaul and servicing of all the major vehicle parts (excluding body) including engine, valves, diesel fuel injection systems, cooling system, clutch, brakes, steering, front and rear suspension, transmissions (except overhaul), drive shafts, electrical equipment with wiring diagrams, exploded views and complete technical data. 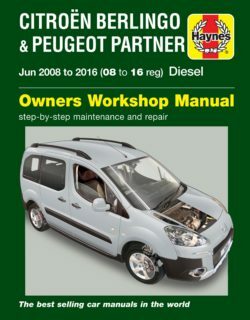 Small though this Workshop Manual is in size, it lacks no detail in covering the whole of the servicing and repair of the latest Citroen Relay and Peugeot Boxer vehicles with the 2.0 litre HDI direct injection diesel engine (engine type DW10 UTD) from 2001, also fitted to the Fiat Ducato and known as JTD engine. 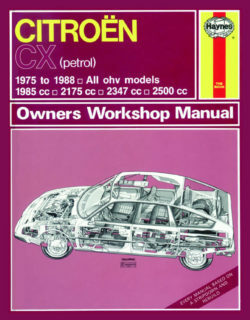 The information in this manual is based on the Citroen information. Hatchback, including VTR, VTS and special/limited editions. Petrol: 1.0 litre (954cc), 1.1 litre (1124cc), 1.4 litre (1360cc) and 1.6 litre (1587cc), inc. 16-valve. Does NOT cover 3.0 litre V6, turbo or 2.0 litre VSX 16-valve (150 bhp) petrol models. versions. Hatchback, Estate and Coupe, inc. special/limited editions. Petrol: 1.4 litre (1360cc), 1.6 litre (1587cc) and 1.8 litre (1761cc). 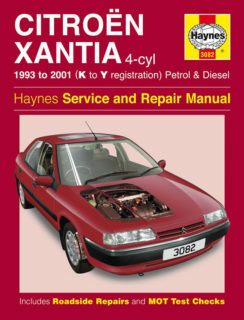 Also covers 2.0 litre (1998cc) engine used in some non-UK markets. 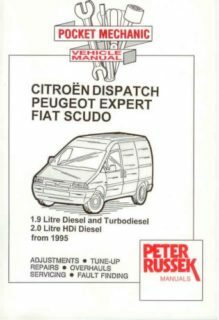 Diesel: 1.9 litre (1868 and 1905cc) and 2.0 litre (1997cc) inc. turbo-Diesel. Does NOT cover 2.0i 16-valve VTS Coupe, Picasso, or ‘facelifted’ range introduced October 2000. 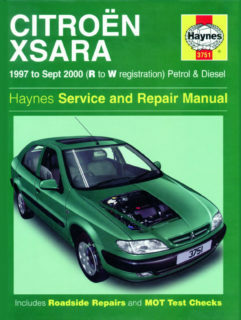 For coverage of Xsara Hatchback, Estate and Coupe see manual no. 3751. 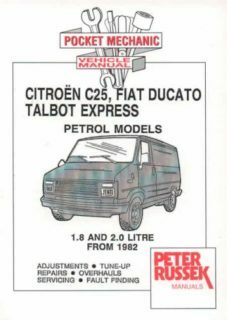 Petrol: 1.6 litre (1587cc) and 1.8 litre (1749cc).Turbo-Diesel: 2.0 litre (1997cc).